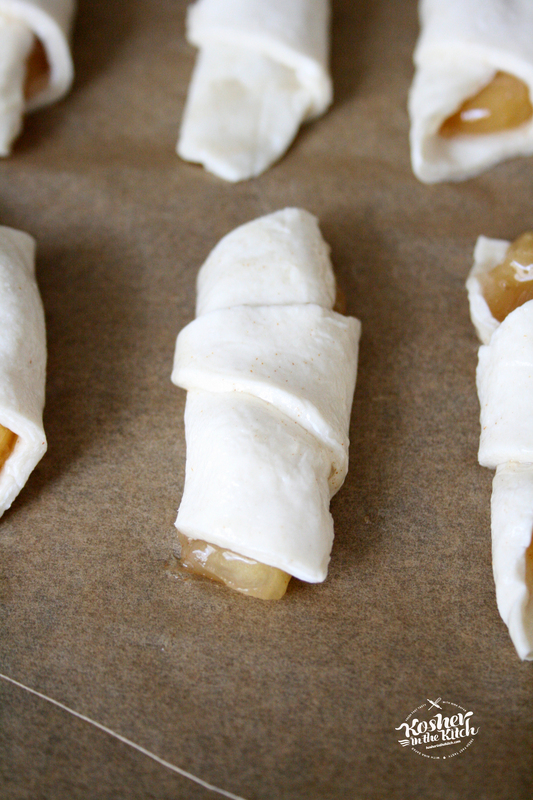 TWO Ingredient Apple Pie Rugelach - Kosher In The Kitch! 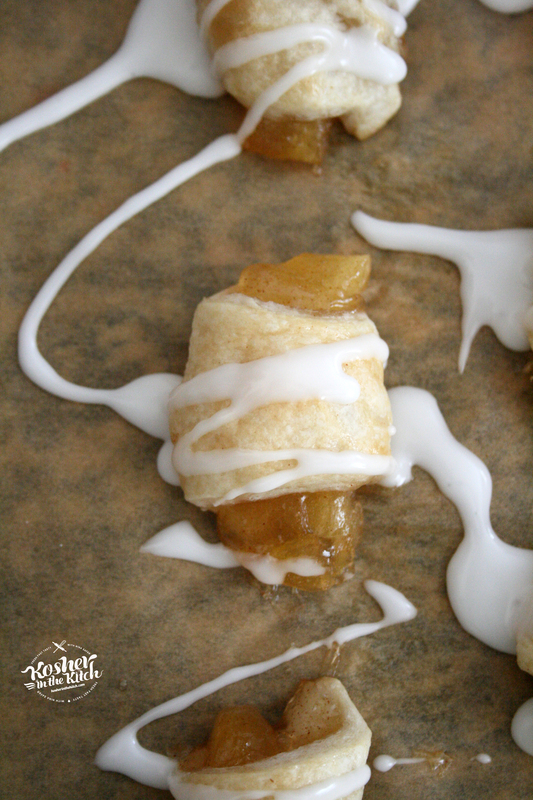 TWO Ingredient Apple Pie Rugelach - Kosher In The Kitch! Defrost malawach dough slightly. Cut lines across dough forming triangles. Place piece of apple at wider end of triangle then roll dough inward, from outside rolling inward to center, forming rugelach. Place rugelach on parchment lined baking sheet. 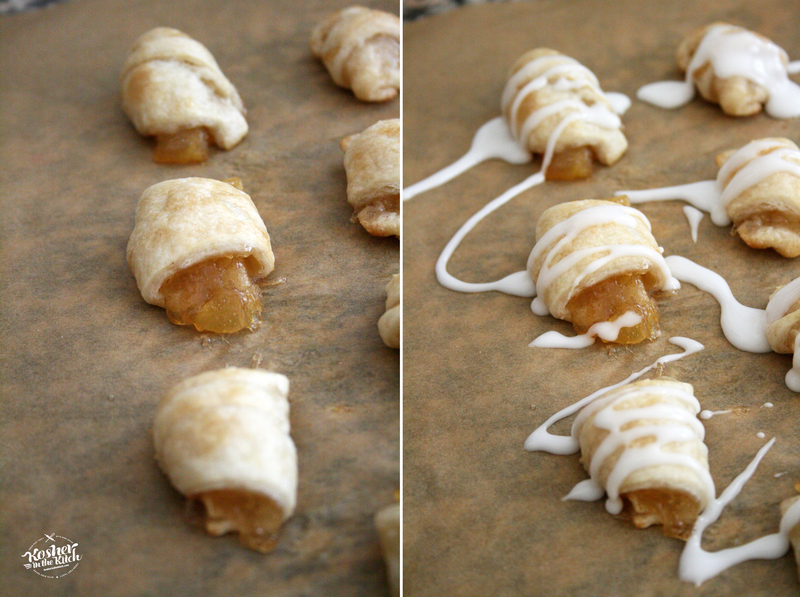 Whisk egg then brush over rugelach. Optional, sprinkle cinnamon sugar on top. Bake on 375′ for about 15 to 20 minutes until dough is golden brown. Allow to cool off before drizzling glaze on top. Optional: serve with coconut cinnamon whipped cream, recipe below. Combine sugar, cinnamon, allspice and flour in a bowl. Peel and dice apples. Combine with juice of lemon in a bowl. Place sugar mixture over apples and combine well. Puree apple mixture using a hand blender. Using an ice cream scooper, spread apple mixture over malawach dough. Using a pizza cutter, cut triangles out then fold up from the largest end going inward, forming regulach. Place on parchment lined baking sheet. Whisk egg then brush over rugelach. Optional, top with cinnamon sugar. Bake on 375′ for 15 to 20 minutes until dough is golden brown. Serve with coconut cinnamon whipped cream or cinnamon glaze. Refrigerate coconut milk overnight. Open can and scoop out the solid coconut cream that forms on top. (Reserve the coconut water for a smoothie!) Using a cold metal bowl and beaters (place both in freezer for about 10 minutes before making whipped coconut cream) beat the coconut cream until soft peaks form. Add powdered sugar, vanilla and cinnamon and continue beating until combined. Hi. 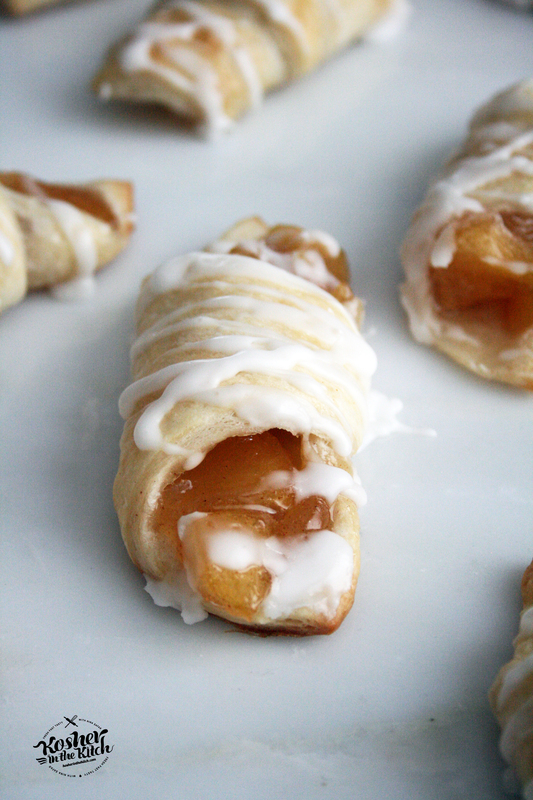 Could you do this with puff pastry? What a great idea! Could I use different fillings for this? (Chocolate, cinnamon, jelly..?) thanks! Hi Chaya! Yes you can use different fillings. 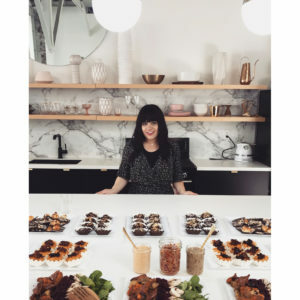 I have used apple pie, cinnamon, chocolate, and cheesecake fillings as well as savory fillings such as deli meat with mustard, bbq chicken and taco meat! I’m going to try this with puff pastry.